1 ¾ acres of grounds including award winning gardens with over one hundred different tropical plant varieties as well as Kariwak’s kitchen garden. Lounge in the library and TV room near the bar or in the hammocks near the waterfall pool. One main, ozonated, chlorine free swimming pool (3 feet shallow end, 7 feet deep end). 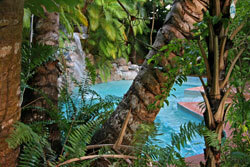 One small, waterfall pool in the gardens (2 feet deep with ground and side jets). Daily complimentary shuttle bus to and from Pigeon Point Beach leaving the hotel around 10am and picking up at the beach around 4pm. Store Bay Beach is 5 minutes walk away. Beach towel service provided at Front Desk. Morning yoga, tai chi and qiqong classes 8-9.15am most mornings, complimentary to registered guests. Evening yoga classes and private yoga sessions available for an additional charge. A variety of bodywork treatments available by appointment through our therapy centre. Bird watching, sailing, horseback riding, island tours, watersports, car and bike rental can all be arranged by request. 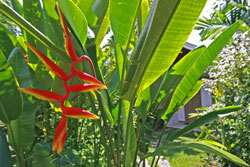 24 rooms with air-conditioning, hot/cold shower, telephone, wireless internet, patio area. Hair dryer, clock radio, iron and ironing board, ice bucket and water pitcher in room. Extra mattress and/or crib available by request. Laundry service available (not dry cleaning or ironing). Early bird, self serve coffee and tea service from 5am – 7am for registered guests. Restaurant serves breakfast, lunch and dinner every day, salads, sandwiches and sweets throughout the day. Early children’s dinner available by request e.g. baby food and/or 6 o clock kids dinner. Special dietary needs accommodated by request; best to notify kitchen before arrival.